Scott Gault of Piedmont has once again earned a spot on the men’s U.S. Olympic Rowing Team. Gault, who first competed in the 2008 Summer Olympics in Beijing, will be going to London for the 2012 Summer Olympics upon the U.S. Olympic Committee’s final approval. Gault, 29, is a Piedmont High School alum who began his career with the Oakland Strokes Rowing Club in 1999. San Rafael High alum Steve Detwiler delivers back-to-back home runs. The inaugural season for San Rafael’s new minor-league baseball club got off to an exciting start this week as the San Rafael Pacifics took their home opener 3-1 over the Sonoma County Grapes on Monday night. Designated hitter and San Rafael High alum Steve Detwiler scored twice with back-to-back home runs in his first two at bats. 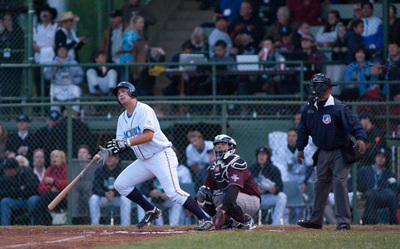 Lead-off batter Frederick Atkins, formerly of the College of Marin, also picked up a home run for the Pacifics. Project portfolio management company Metier has relocated from Santa Rosa to Healdsburg. Metier is hiring a dozen additional employees in the new location, and said it hopes to increase its staff from 50 to 100 over the course of the next year. The new Healdsburg headquarters was picked for its appealing office space and local scene. Calistoga City Council members approved plans for the 10,000-case Brian Arden Winery at the foot of Mount Washington on Tuesday after the owners whittled off 1,000 square feet from the original plans. The unanimous vote came in spite of consistent complaints from the owner of the nearby Aubert Winery, who cited issues such as unsightliness, blocked views, and concerns that Brian Arden would drain storm water down the wineries’ shared driveway. Workers prepare the final beam in San Francisco General Hospital’s new construction. Construction of the new acute care facility at San Francisco General Hospital reached a milestone this week as the final steel beam, bearing signatures of staff and members of the community, was added to the frame during Tuesday’s topping out ceremony. Those in attendance included neighbors, patients, hospital staff, and Mayor Ed Lee and other city officials. The new unit is expected to be up and running in late 2015. The city of Concord is shutting down the Contra Costa Certified Farmers’ Market. The market had been scheduled to assemble every Sunday in the Concord High School parking lot, but it failed to obtain proper approval from the city. The last market at the high school will be held this Sunday from 10 a.m. to 2 p.m., although the Contra Costa Certified Farmers’ Market also hosts markets in both Walnut Creek and Orinda.